Chinese culture is filled with colorful traditions, the most popular one is the Chinese New Year, on of the creatures that is granted honores is the Chinese Dragon that according to chinese tradition was capable of calling for wind and summon rain, breath fire through their mouth, fly as high as the top of a mountain or swim to refuges in the middle of lakes, they could also change their size and become as big as a modern skyscraper or as little as an ant. They are admired in China and their tradition pays them a lot of respect, not like their western counterparts that were feared, dragons are a very important part of chinese culture. This game brings 243 ways to win on its 5×3 set of reels, the symbols that were designed for this game include dancing people and dragon alongside the traditional set of 9, 10, J, Q, K, A cards. 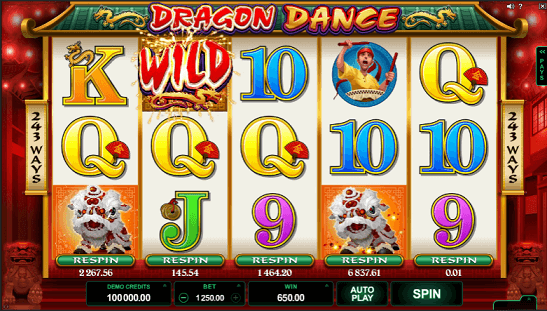 Microgaming decided to release this game with features used in some of their other games, like the traditional wild symbol can help generate wins simply by combining with other symbols to complete a winning line. More than one Wild Symbol appearing in a line can help generate large wins, it doesn’t just have to be one Wild Symbol. Actually, the more wilds that appear, the larger the win is. The one feature that is not that common is the respin button, it is located on the bottom of every reel and it will give players a second chance to get a win on every spin, by taping it players will spin again a single reel, but be careful because the price to pay for every respin varies depending on your odds of getting a good win after the respin, watch out for the price can go up to 96 coins. Microgaming released two games at the start of the year, they were Bikini Party and this one, both of them are pretty much the same game but with a different theme and I find that to be a bit lazy. Even when the respin button is a good feature it can get ridiculously expensive, players might find themselves in a situation where betting 96 extra coins could get them a 260 coins win. For a game to be successful it needs a good theme, high profitability and a good set of features, Dragon Dance is not great on the first two and in the third one it is not good enough to make up for the other two. Microgaming is one of the most important companies on the video pokie market, yet they decided to launch two identical games at the same time, I don’t understand that decision since it means players will enjoy only one of them because by the time they try the second one they will find exactly the same product except for the theme. I do not think players should pick this title over other options in the market, even other Microgaming titles released a few years ago are better options than Dragon Dance like Rugby Star, Lucky Leprechaun and Play Hippo. Play This Slot And Get $200 Bonus + 10 Free Spins Now!